The one section of my wardrobe that you've never really seen much of is my workwear (unless you follow me on Instagram, where I share the odd peek). By the time I get home from work, the last thing I want to do is a photoshoot. It's also that time of year when it's dark when I go to work in the mornings, and dark when I get home in the evenings. I really wanted to share this workwear outfit with you though, because of the beautiful pencil skirt. So, please excuse the moody lighting - I'm afraid that this is as bright as it gets in my hallway with all the lights on! The task of finding the perfect pencil skirt is never easy. 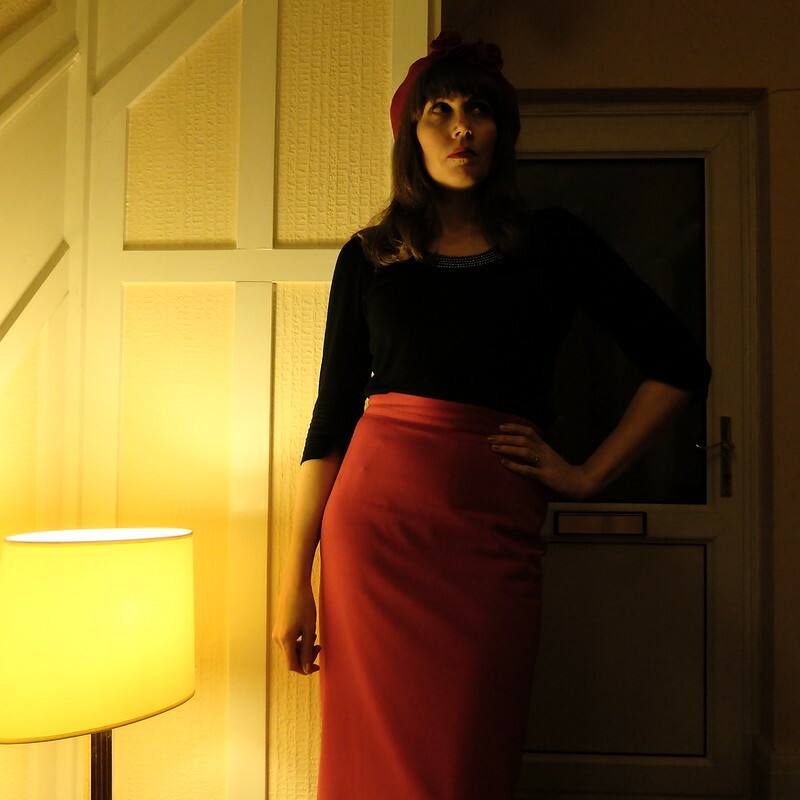 My search was made more difficult, not less, by the fact that I already have one perfect pencil skirt in my wardrobe. It's a plain black version from Hobbs. Beautiful fabric, lined, snug on the waist and long enough to hit mid calf on me. If they had made it in different colours I would have snapped them all up. Finding another perfect pencil skirt in a different colour has been problematic. I did well with a casual denim skirt from M&S, but I wanted another work appropriate one. My choices seemed to be Vivienne of Holloway, Pretty Retro and House of Foxy. Between all of these retailers there was quite a choice of colours, patterns and fabrics. Ultimately for me though, clothing decisions rest on one simple question: "how long is it?" 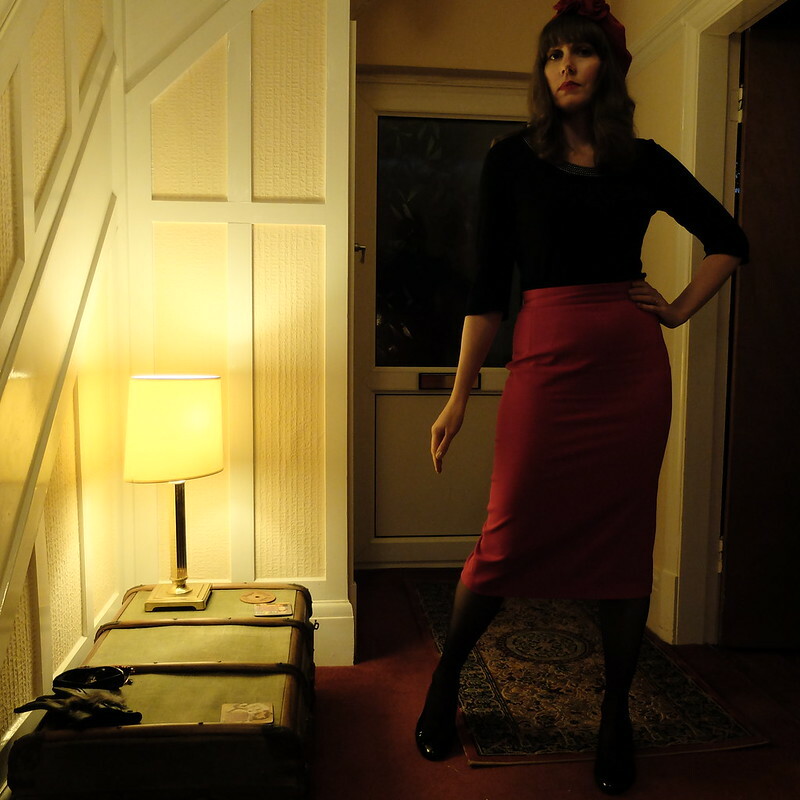 I went for the House of Foxy pencil skirt in red, mainly because their skirts are 31". Priced at £55, I used a £5 off voucher from leaving a review on a previous purchase, so it effectively meant my postage was free. The fit is very good. 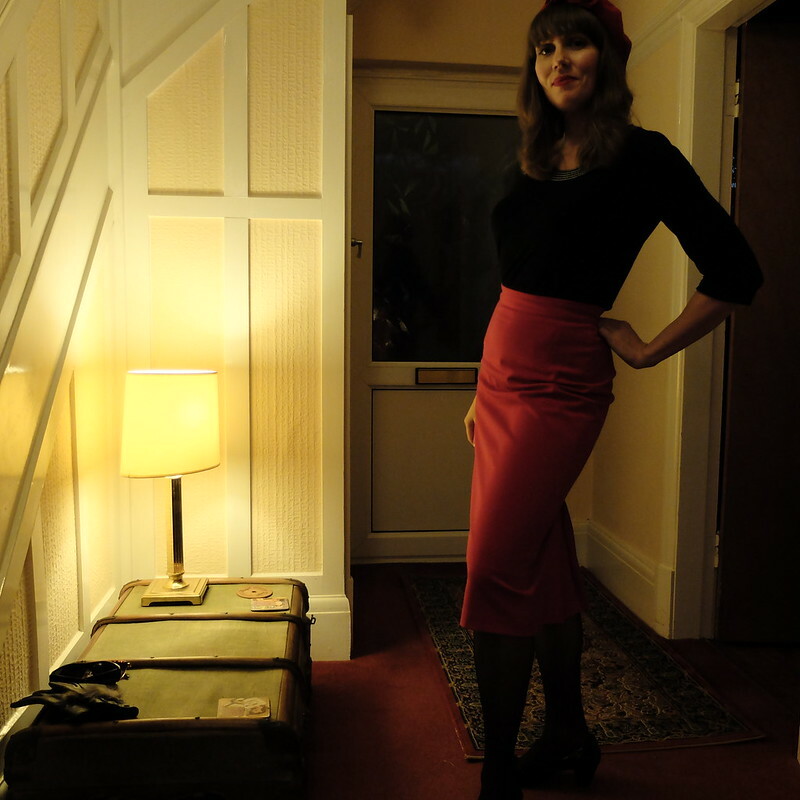 It's not a tight pin-up fit for evening, rather it's a great skirt for day wear. The back vent allows for brisk walking (essential for those rushed mornings getting to work). The waistband is roomy enough to tuck a top in, and the fit over the derriere and hips is not so tight as to draw attention to any foundation garments. Very work appropriate. And lunch appropriate! It's very important to have room for food. I wore it all day without issues - there was no riding up, and no creasing of the fabric. Finally, it has a vent at the back rather than a split, which is another feature that makes it a really good option for work. Have you found the perfect pencil skirt? I'll let you into a secret, normally I dislike pencil skirts but that's until I saw you in yours! You've got in just right, the perfect length, figure skimming rather than figure hugging and in a classy colour. You look like a classic Hitchcock heroine, gorgeous! The perfect pencil skirt is so important to have in the wardrobe. Super versatile staple! Yours is fab! And yay for it being long enough! ! I have I think 5 skirts that I made from the same pattern, in different colours and prints. Once I got the pattern right, every time I need a new one, I pull it out again! And definitely vent over split!!! Looks fantastic on you Porcelina! Congrats on finding a red pencil skirt that works so well. That's great too that it doesn't crease or ride up! I know both issues can be such a pain! How great is your figure? You really work a pencil skirt! Thanks for the writeup, it's very useful. I've been wanting one for a while, and had been thinking of getting it from Pretty Retro, but shall look at Foxy again instead. (VoH cuts for more strongly hourglass figures than mine, so they're never on my list for fitted stuff.) The vent is an especially nice touch. 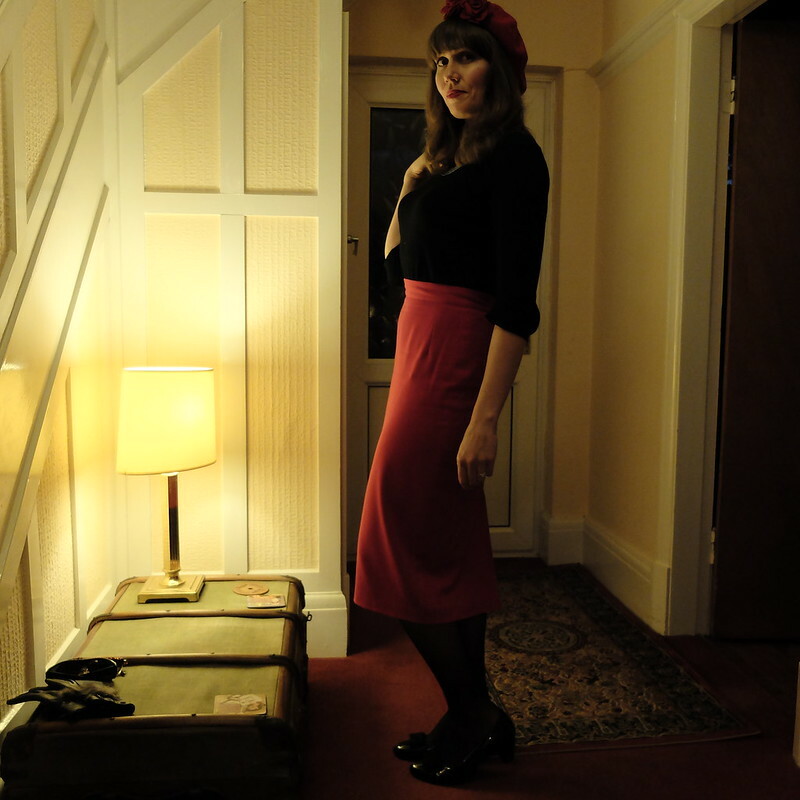 I am actually yet to find the perfect pencil skirt - I used to buy mine from PUG but found them all to ride up and crinkle, one of the reasons I stopped wearing pencil skirts entirely. However I have also been eyeing off the HoF pencil skirts - love the look of the cream one so I am even more convinced that I should get it!